We stay way too long in lovely Dushanbe, but finally we leave. We are excited to be on the bike again and to start on the M41, the famous Pamir Highway. Two things are different from before: we are no longer cycling with just the two of us, and for the first time since we set off I’m having stomach problems. Together with Steffi and Adriano (aka Team BimBom), Jean and Verena we set off on the North route from Dushanbe towards Khorog. The North route is the famed M41. It has a road surface that varies between almost-ok and horrendous, doable gradients, just enough villages with food supplies and it includes conquering the 3252m Khaburabot pass. There is an alternative route as well. The South route doesn’t cross any mountains and has good road surface but it also has the most traffic. Since we haven’t cycled for more than a month and we can’t wait to get away from traffic and into the wild we pick the North route. We figure we need all the climbing training we can get before we start the steady climb from Khorog to the Pamirs proper. This is our Pamir prelude. The first day is hard. The road out of Dushanbe is busy but with good surface. Our legs and the rest of our bodies are having a really hard time but we are excited and happy to be back on the bike again. It is difficult to keep up with the ambitions of the rest of the (much fitter) group. This creates some tension so after a few days we let them go and we are all free to ride at our own pace again. After the first day the traffic mostly disappears but the road gets much worse. Dusty gravel, loose round riverstones, or packed earth with big rocks sticking out of the surface. Despite the ongoing and ever worsening stomach trouble we keep going for 4 days, gradually climbing towards the pass. When cars come by they kick up a big cloud of dust and I start wearing a kerchief around my face to avoid breathing in the dust. The beauty of the surrounding mountain peaks and valleys is very rewarding though, and we are glad we picked the North route. We find good camping spots and enjoy the warm days and cool nights. Riding through the villages we feel like rock stars, high fiving with all the kids who run out to meet us. They give us candy and apples. On the 5th day however my energy level suddenly drops to zero and I can no longer go on. We decide to turn back to Qalaihusain, the last village we passed, and check our options. Stay in Qalaihusain to rest up or find a taxi to Qalaichum where there is a doctors post? Ibrohim is our (expensive) knight in shining armour. He will drive us with his fancy Jeep to Qalaichum for 100USD, which we bargain down to 50USD in the end. He doesn’t speak English and we don’t speak Russian but we manage. He takes us to his house, a beautifully maintained little farm, and we spend the night with his family. We have our own room with traditional futon mattresses on the floor, there is chai and snacks and I’m grateful for the chance to rest up. I’m in a deep sleep by 4pm. At 5am we leave for Qalaichum. It’s a great ride and I’m sad we are missing out on cycling the Khaburabot pass. The gradients seem doable even if the road is in really bad condition. We pass the tents of Verena, Adriano and Steffi who made it to about 3000m. Ibrohim plays mesmerizing traditional Tajik music and we are only slowly waking as the sun comes up. He is a very good driver with a good car so we feel safe and secure. Apart from one incident where he chases a hare with his Jeep, zigzagging over the narrow gravel road. He laughs heartily at our shocked faces. He stops the car to check if he will have hare for dinner but he missed it. On the other side of the pass he amuses himself by chasing little flocks of small partridges over the edge of the cliff. Just before Qalaichum he drops us off. Despite a last ‘misunderstanding’ about the agreed price we are happy with Ibrohim who took very good care of us. Qalaichum has everything we need: a hospital, a pharmacy, supermarkets and a relaxed little homestay where we check in for 2 nights. I manage to sleep almost 36 hours straight, only waking to eat a little bit and take my medication. On the other side of the river that runs through Qalaichum is Afghanistan, and just like in Armenia it feels weird to look across at a country that we only know from bad news on tv. Everything feels peaceful here, but the Pamir region is culturally quite different from Tajikistan, has separatist tendencies and we need the special GBAO (Gorno-Badakshan Autonomous Oblast) permit to travel through. We catch up with Jean, Verena, Adriano and Steffi as they pass through the village. I’m getting better fast so we will leave for Khorog tomorrow. I remember when we said to eachother ‘now when will the real adventure start?’. Tajikistan is definitely real adventure. The highest mountains, the remotest villages, the most bureaucratic procedures. Getting sick, keep going, trust strangers to help us when we are not well. We have to show our passports to bored (but armed) soldiers at checkpoints who don’t have a clue as to where The Netherlands is. The highway is a winding dusty gravel trail with a towering cliff face on our left and a sheer drop on our right. The views are never less than breathtaking. The women in the villages all wear traditional dress. Some girls’ hands are died orange with henna, the adults all have gold teeth and old men wear long white beards and little black square hats. We are in awe of how clean, well-groomed and dignified the people are in these remote, poor and dusty surroundings. We are so scruffy by comparison, it’s almost embarrassing. Sometimes we have to wait for big herds of sheep and goats to pass us before we can get back on the road. The herdsman here are real cowboys on horses, with a couple of donkeys who carry their stuff and a pack of dogs to guard the herd. They wear long, thick padded velvet coats. At one lunch spot we share the shade with a young herdsman who is skyping with his buddies, showing two little squealing lambs to them with his smartphone. A funny clash of modernity with tradition. Camping in Tajikstan is great. There is so much space around, an almost full moon, so many stars. Washing in the river. Trying to keep a hungry fox away from our supply of Snickers. For the first time we make a campfire and we sip cheap Tajik cognac to keep us warm in the cool night. It is still hot during the day, but autumn is coming fast so we enjoy the warmth while we still can. The Tajiks speak a form of Farsi but it sounds a bit different from what we heard in Iran: Tajikistan becomes Tojikiston. Another difference from the Iranian Farsi is the fact that they use the cyrillic script, which is nice because now we can read the street signs. Russian is widely spoken but outside Dushanbe there are many local dialects. When we were thinking or dreaming about Tajikistan we would always imagine the Pamirs, our skin crawling with fear and excitement. Pictures on blogs and instagram accounts of other cyclists showed desolate mountain peaks in crystal clear thin air, cyclists camping on endless high plains of barren earth, villagers in remote valleys. The Pamir Highway is not really a highway. It is a potholed gravel road which runs from Khorog on the Tajik-Afghan border to Osh in Kyrgystan, scaling several passes and reaching 4562m at its highest point on the Pamir plateau. It is the second highest road in the world, after the Karakoram Highway which runs from China into Northern Pakistan (not an option at the moment due to political unrest and kidnappings). I had never heard of the Pamir highway until we hosted Taneli through Warmshowers, and he put the idea of cycling this route East into our head. I don’t think we ever thought of Tajikstans capital Dushanbe when were dreaming about the Pamirs. That is, any thoughts beyond the need to do our food shopping and some other practical errands there before heading into the Pamirs. As we have found out before, discovering a place that we had zero expectations about is a really nice experience. The weather is lovely, warm and sunny during the day and cool at night but not yet cold. There are shops and bazaars that sell everything we could possibly need. There is beer! Very nice after our dry month in Iran. Dushanbe is small for a capital city and not too busy traffic-wise, with wide tree-lined avenues. The main drag Rudaki Avenue is lined with pretty and mostly well-maintained buildings, an eclectic mix of Asian, Soviet and Muslim influences. An airy open summer chaykhana (teahouse) overlooking a Persian style garden with a small pond in the middle, with a colourful cassette ceiling and almost muqarna-like capitals topping the high pillars. A modernist Soviet theatre that wouldn’t be out of place on Berlins Karl Marx Allee. A few Brutalist Soviet housing blocks, small enough to be actually quite charming. There is a cluster of neo-classicist university buildings plastered in the most brilliant shade of swimming pool blue with white hammer and sickle reliefs. There are also modern buildings going up, but fortunately they are well proportioned, not too outrageously kitsch and even despite the use of the ubiquitous horrible dark blue glass not too much of an eyesore. Because of the upcoming 25th indepence day celebrations there are Tajik flags and banners everywhere, depicting president Rahmon who appears to be (somewhat constipatedly) contemplating grain fields, stroking kids’ heads, inspecting the industry… you get the picture. The Tajik people look decidedly different from the Iranians. Finer and slightly more Asian features, slender people with thick black or dark brown hair. The man mostly sport lego style bowl cuts, the women have long hair. Some still have uni-brows, once considered a sign of beauty. The school boys wear smart black trousers and slim black ties on pristine white shirts (prohibited in Iran!). Many women wear traditional garb: loose trousers, tight at the ankles, under a long loose tunic in the same fabric, with short puffy sleeves. The womens garments have very colourful prints, either in traditional ikat weaving or new synthetic designs embroidered with little pearls. They wear equally colourful headscarves tied around their hair but leaving the neck free. To me they look more decorative than restricting. We meet up with our friends Steven and Saule from Caravanistan, and from Saule I understand that not long ago modern Western dress was more prevalent on the streets of Dushanbe. But as many educated people leave the country more traditional (village) people are left to dominate the dresscode in the city. Traditional dress is further encouraged by the government in an effort to forge a strong and clear national Tajik identity. Not an easy task in such an ethnically mixed country and I don’t really like the idea of an imposed reactionary traditionalist nationalist dresscode. However I do like the clothes, so I have a set made by a tailor in the bazar. One of the people of Dushanbe is Vero, a French woman who works for the EU. She has a wonderful house, surrounded by a large walled garden. We arrive here after dark, emotionally and physically exhausted after a long an stressful day. Completely drained from the effort to get our enormous pile of luggage from Tehran to Tajikistan. We did make it, but not without the generous help of two cycling Iranian brothers and the lovely staff of Tajik Air. When Vero’s night guard opens the gate for us we think we have arrived in cyclist heaven. A small collection of rose bushes and fruit trees on a grass field, a hammock, a house with a kitchen and bathroom generously offered to the cyclists who are welcome to camp in the garden. There are some Koreans, a Catalan couple and two French guys who show us around. Two turtles and a speaking parrot live in the garden. In the next few days we share beers and nerdy bike travel conversation with more cyclists who arrive. 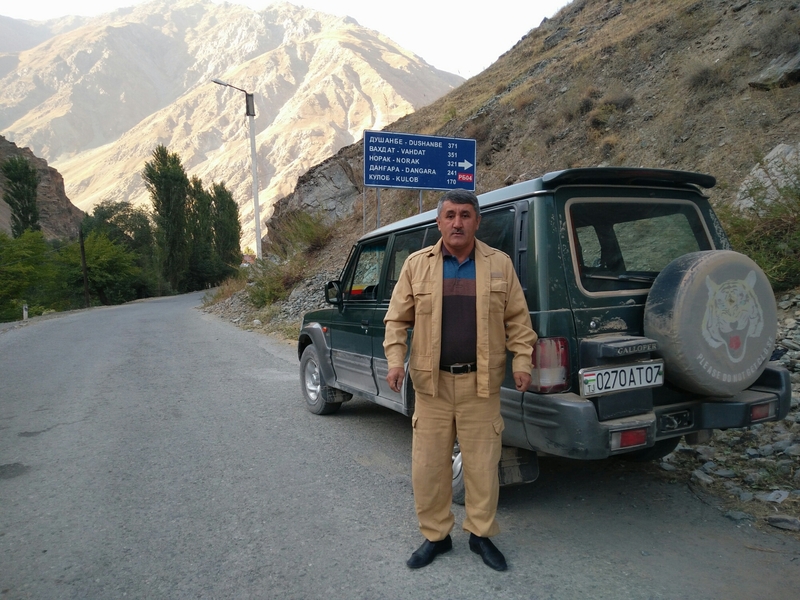 Some have done the Pamirs already and they give us useful tips about hot springs and road conditions. Verena and Jean we have met before, Steffi and Adriano are a Swiss couple we meet a day later, and we make plans to cycle the Pamirs together. Crossing the high peaks we have dreamed about for so long seem a little bit less scary at the prospect of doing them together with friends. We end up spending almost a week in Dushanbe. Not because we have things to do, but because we want to see the parades for the 25th independence day celebrations. The parade is a deception. No one knows when it will happen and in the end it transpires there are two parades; one military and one civilian. Rumours abound: the parade is delayed because Putin couldn’t make it on the actual indepence date! Putin never shows up, we would have known if he had as the presidents dacha is around the corner from our ‘home’ and there are no snipers on the roof. We find out when the parades are on because they are shown live on tv. We rush out to try and catch the second parade after we miss out on the 7am military parade. We miss the civilian as well and see its tail end disappear into the distance of Rudaki avenue. Later we find out that we wouldn’t have been able to get close to the parade despite several security checks we passed. Only a small number of vetted Tajik loyal supporters of the president got a certificate that allowed them to line the route of the parade. The whole operation (16.000 soldiers, 25.000 civilians) is put on to please president Rahmon and to look good on tv, and not an actual celebration for the people of Dushanbe. In fact, the involuntary participants of the parade have to fork out quite a bit of their own money to pay for their compulsory costumes. After having missed out on the chance of seeing a totalitarian dictator display his charade we go on an interesting excursion. Khodja obi Garm is a former Soviet sanatorium some 50km North of Dushanbe, in use since 1935. The spa is a stunning Brutalist complex nestled in a gorge almost 2000m above sea level. The spring waters are hot and naturally suffused with the radioactive radon gas. This is supposedly curative, but radon is in fact poisonous in large doses and a fairly common health risk as it is everywhere around us. We go with our new Swiss friends and check in. First we get served lunch in a big communal dining hall by traditionally dressed Tajik women. Veggie soup with lots of fat floating on top, dumplings in sour cream, even the menu here is vintage. I then start with a rough Russian massage. Kneading, slapping, knuckle grinding, scalp scratching, hair pulling and some really good vertebrae cracking. Then, into the hot radon pool. It is quiet in the resort so we have the pool to ourselves, apart from Moheddin. He is a jolly Pamiri mountain man who used to sail the big seas and proudly shows us his sailor tattoo. The treatments are very relaxing and in the afternoon we get lulled to sleep by president Rahmon who on tv, endlessly droning on in front of an audience that manages to stay awake. We are greatly enjoying ourselves in the sanatorium, especially when we discover a basement bar with beer and a pingpong table. After a good nights sleep in the spartan little room and a simple breakfast of baby porridge, bread and tea we do one more treatment. Steffi and I pick the ‘tsirkulyarniy dush’. This is a circular shower contraption spouting needle sharp jets of water from all around and apparently good for the circulation. As a bonus there is a chair with a hole in the middle and a jet underneath, so all our bits get the circulatory treatment. Cyril and Adriano disappear into another room and get to torture eachother with a superstrong jet stream, managed with a cool looking 60’s control panel. According to Cyril it’s the weirdest thing he has ever done with another guy. There are more interesting looking rooms where for instance you can have your head pulled back by a torturous looking helmet and leather strap contraption, but we have to head back to Dushanbe. I can definitely recommend this place to cyclists who come back from the Pamirs and need some regeneration. Dushanbe, a small capital city of a small and remote country. What a nice surprise.